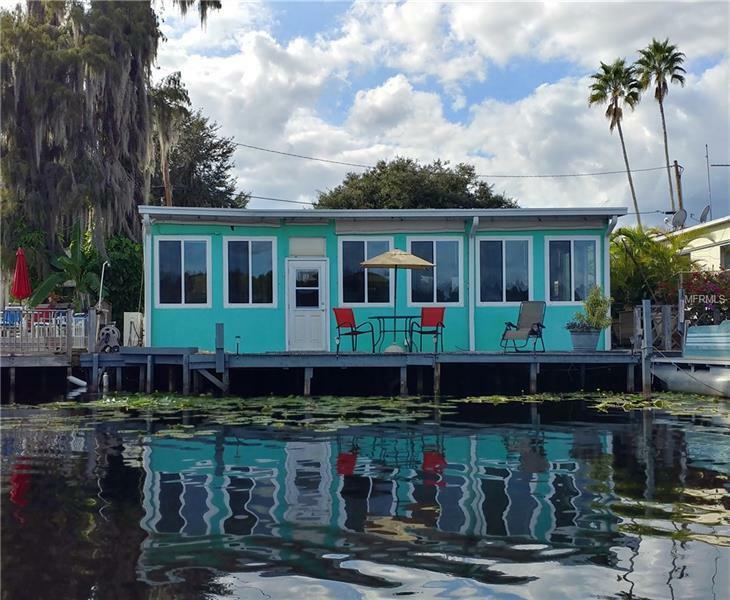 spacious waterfront mobile home with large addition and dock facing Lake Como. Handy location in between the quiet sandy beach and the community pool and restaurant. 33' long family room with all new insulated thermal windows, ceiling fans, built in bookcases facing the lake. Nice kitchen with real wood cabinets, lots of drawers and pull outs, built in wall oven, recessed space for frig, gas cooktop, skylight and recessed lighting opens to dining room and living room with built in bookcase. Ceiling fans throughout, roof approx 3 yrs old. Present layout has one bedroom, full bath and former 2nd BR is now a large half bath, utility room and storage space. Features 2 electric central heat and air units, track lighting, washer/dryer, blinds and nice flooring, including ceramic tile, carpet and laminate. Located in the private Lake Como, Lake Como Resort is a resident-owned cooperative and a family-friendly nudist community.